aFe's Magnum Force BMW Intakes offer proven performance, value, and a clean install all BMW owners look for. We like the aFe intakes a lot. So much, we keep all aFe BMW application in-stock! Each kit comes as an engineered system fine tuned to maximize performance gains without check engine lights or fitment issues. High quality components like their lifetime reusable air filter elements and smooth injection molded plumbing allow the use of more complex intake tube designs which focuses on increasing airflow and velocity creating power. aFe's innovative filter design is the next evolution of the lifetime, user-serviceable filter. Unlike the traditional oiled fabric filter which uses layers of cotton gauze, aFe filters are made from 6 staggered layers of purpose woven cotton fabric of decreasing weave size. 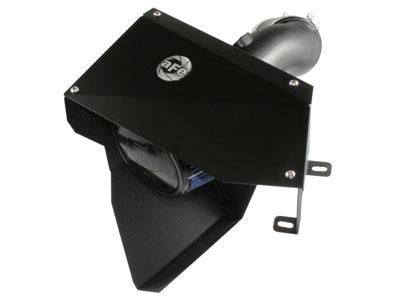 This maximizes airflow while ensuring that contaminates are kept out of your BMW's engine. Kits are designed with heat shielding which rejects surrounding hot air from the engine compartment, meaning the intake charge is as dense as possible thus generating maximum power. Several aFe kits also replace the factory mass air meter housing (sensor insert is transplanted), and employ a cover to fully enclose the intake compartment. aFe's kits use existing mounting points, so there is no need to drill into or modify your car. Available for a variety of applications, VAC has back-to-back dyno tested some of aFe's systems and they net great results. A true value in BMW high performance. aFe manufactures and private labels filters and intakes for TRD, Mugen, and others who don't just want to perform better, but want to win. This is our intake of choice. 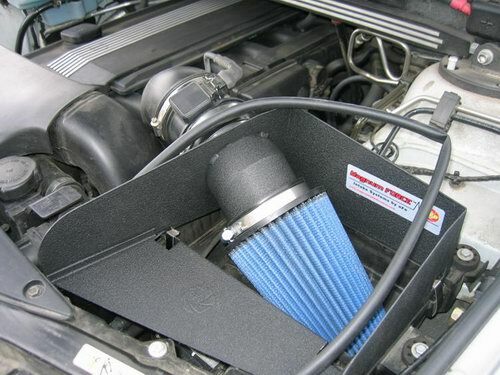 Notice the cold air intake's design does not go low, making the worry of inhaling standing water, no worry at all! See the gasket being installed that helps seal the colad air chamber against the hood. We can order any aFe kit you like, not just BMW. Call or email so we can special order one for you today! VAC keeps all popular applications in-stock. VAC can get your aFe intake to you fast! We keep popular applications in-stock. Call or email if you need to special order any application from aFe.